The local Administrator account becomes the domain Administrator account when you create a new domain. The new domain cannot be created because the local Administrator account password does not meet requirements. Currently, a password is not required for the local Administrator account. We recommend that you use the net user command-line tool with the /passwordreg:yes option to require a password for this account before you create the new domain; otherwise, a password will not be required for the domain Administrator account. This will ensure that the Administrator account requires a password, and that a password is set. After running this I was able to proceed with the promotion of the server to a DOmain Controller. One of the last steps in an Actiove Directory migration is the removal of SIDHistory from migrated users, computers and groups. This will help reduce the size of the directory database. Before cleanup of SIDHistory domain-wide, you should perform cleanup on a single OU and analyse the effects on applications such as AzMan and Sharepoint. Watch out for DCOM remote launch pernmissions. It is possible to modify the script to target individual users for this purpose. The following VBScript will perform a SIDHistory cleanup of all user objects (this can be altered) within a particular OU. It is possible to change the LDAP filter and OU string to suit testing and cleanup of various object classes. Alternately, by changing the line strOU = “OU=UK,” to strOU = “” willl perform SIDHistory cleanupon all objects within every OU. Remember to perform cleanup on the following objectClass types, changing the code in RED will allow you to perform cleanup of different objectClass’: User, Computer, Contact, Group. For some reaosn the client had detected the users stub-mailbox in the target environment and automatically configured the users MAPI profile to connect to it. The main issue with this being that this mailbox was incable of recieving email due to the redirect setup back to the source environment. Thus, the only way to resolve this for the user was to rebuild their MAPI profile, until they load Outlook agin and the same thing happens! Exchange 2007 was running in the target domain. The users were logging in to the target domain, accessing a mailbox in the source using the Associated External Account (AEA)setting on the source mailbox. There were a small number of migrated mailbox users connecting to the new Exchange Org. Outlook 2007 supports Autodsover, which was available for the users that were loggin in to the target domain. Using OWA and locating a user in the GAL or a Free/Busy lookup in the Outlook ‘thick’ client would trigger the stub-mailbox to become ‘active’ – it would suddenly have itemCount and totalItemSize attributes. On load Outlook 2007 performs autodiscovery, it would then detect the users new mailbox and display the above message. The biggest problem here is that nothing is actually going wrong. Exchange is designed to create a mailbox on Free/Busy lookup via OWA or the full Outlook client. 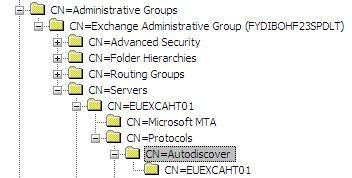 So the question was how to break Autodiscover for non-migrated users only. The Offline Address Book failed to download for Cached Exchange Mode users. The Out of Office Assistant would fail to load. All of these side-effects were caused by Autodiscover being unavailable to Outlook 2007 clients connecting to the new Exchange 2007 Org. Next we configured the IIS Virtual Directory on the Client Access Servers to Deny Connection to users that had not been migrated. This meant compiling and maintaining a Active Directory Security Group containing all mailbox migrated users. Whilst this stopped the clients detecting the mailbox on the new server it meant that non-migrated users were plagued with Authentication requests to connect to the Client Access Servers asthe Outlook Clients had still detected the Autodiscover Configuration via the SCP record in the Active Directory. Why migrate unused service accounts, user objects and computer accounts from your source domains to the target? A migration is an ideal opportunity to cleanup all of the disused and legacy objects from your environment. A simple way to achieve a user purge to is to query the lastLogonTimeStamp attribute on all user objects. This will immediately provide a reliable picture of recent account utilisation across the domain. The lastLogonTimeStamp attribute is new to Windows Server 2003, as opposed to the Windows 2000 lastLogon attribute which will vary on each Domain Controller within the domain, is replicated to all Domain Controllers. ‘ Constants for the NameTranslate object. ‘ Specify the NT name of the user. ‘ Distinguished Name required for the LDAP provider. ‘ Initialize NameTranslate by locating the Global Catalog. ‘ Use the Set method to specify the NT format of the object name. ‘ Use the Get method to retrieve the RPC 1779 Distinguished Name. 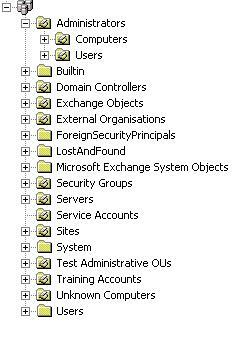 ‘ Bind to the user object in Active Directory with the LDAP provider. ‘ This code prints the last logon timestamp for a user. With regards to computer accounts, don’t worry too much about the cleanup of these objects as you will be migrating all of the active computer objects within your environment individually duringthe migration process. Therefore what is left is likely to be the disused / legacy objects. This helps to further justify normalising your OU structure prior to the migration process (see here.) Without normalisation of the Security Gorups into a particlar OU it would be more complex to return the required information. Perform the same steps with your Distribution Lists to ensure you’re not wasting time an effort migrating objects which are no longer in use. Finally, if you are using the Quest tools identify which customAttributes are in use within your environment.These attributes are essential during the migration and each source pair will require 2 free sttributes for the duration of the migration. You can clearly see the division of user and computer objects, Exchange objects (excluding User Mailboxes), service accounts and server objects. This structure allows for simple Group Policy management as well as simplified administration. By performing the above process on each of your source environments this will speed up the process of migration as the administrators do not necessariliy need to be familiar with the source environments to perform a stream-lined and well-structured migration. Just be careful when moving objects into new OUs as this can change Group Policy inheritance!